Steve got on our case a few weeks ago about being “Crack Adicts”. Gu, Carboom, Cliff Shots … whatever you call it. He wants us to try and not take as many of them as we have been (varies by person) to get our bodies to be better at processing fats instead of glycogen in our bodies. I went through something similar a few years ago. Over the last couple of weeks I’ve been trying to have less and less Gu. On long runs waiting an hour initially, now an hour and a half. At the same time I have been much better about making sure I eat and hydrate well throughout the week. On today’s 24 mile run it was a little warm and I wasn’t too sure about how I would handle not eating much. I ended up taking my first Gu right after an hour and a half of running (more if you could stopping for water). I’d normally then lock into just taking one every 40 minutes. At an hour and a half I was starting to feel a little lethargic but not bad but I figured I might as well. Then we kept running and it was around 2 and a half hours that I had another Gu. I don’t think I’ve run 24 miles with 2 Gu’s in quite a while. Two of the water stops (one we hit twice) did have gatorade so I can’t discount that. I did take six thermolytes (2 for every hour) and those seem to make a huge difference. During the week unless I was running over 2 hours I wasn’t taking any Gu either and it was fine. As long as I can keep my nutrition going the long run may be the only time I need a Gu, but we’ll see. I can’t afford to be zonked out at work so a Gu towards the end of a run may be useful just to keep my energy level up. 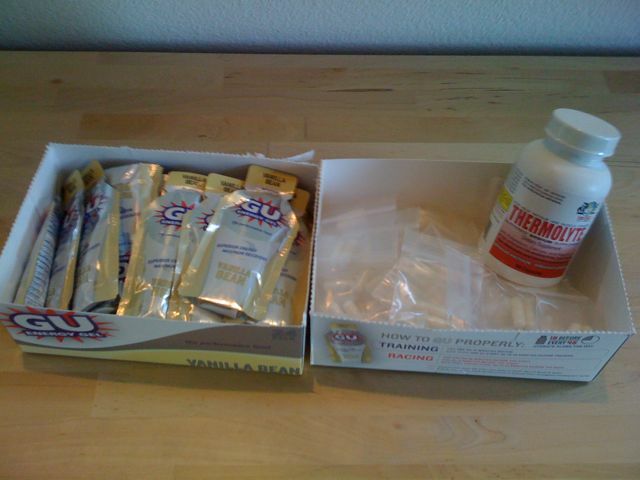 Here’s a picture of my Gu and Thermolyte prepared stash. The Gu should last a little over two weeks and the bottle of thermolytes (packed in baggies of two pills per serving, thanks for the tip Mike) should be enough for over a month. It’s pretty east to calculate what I need from now to the race so I add it all up and ask the folks at Rogue Equipment to add that to their store order for me. I may need to order some more stuff through them since this is part of what I got for Boston buy bailed mid training program. After my long run on Saturday I was talking with a friend about hydration and nutrition on long runs and during races. I’m not an expert on nutrition or hydration, for what you need based on your specific body type, sweat rate, goals etc nothing beats seeing a nutritionist. This is more on the part of things you can control yourself before, during and after a run or race. The most important thing is in my opinion is to plan it out and rely on yourself. With a group like Rogue we’re fortunate that we have water out on the course on long runs, track workouts etc. On the longer and warmer days there’s also Gatorade mixed in. In the end on these runs you don’t know going into it what will be out there. Even on races, you don’t know if the Gatorade or energy drink will be mixed well, diluted, super strong or just plain old nasty tasting. After training for 6 months for a marathon it’s a shame to leave all of that to chance. Again on this I need to thank a few people from Team Rogue for teaching me something about this during our training for CIM. I always took GU on long runs and for CIM planned to just do that and made do with the water and cytomax at the race. I stole a page from the rest of the guys plans and started taking thermolytes (for electrolytes) and GUs on all my runs … as long as I got water on a run I had everything I needed for a run or race. It was kind of nice, didn’t have to worry about anything but getting water on the race. Also on training runs knowing I have everything I need, and don’t have to think about … “where is the Gatorade”, or don’t get tiered from not being able to absorb water without enough electrolytes. Advice #1: Figure out what you need on a run and race and try and get at much of it yourself, not relying solely on others to provide it who you don’t really know. Advice #2: Recovery drink. You HAVE to have it on any medium to long run. Within 30 minutes of ending your run. You will recover better, and have energy during the day. Advice #3: Hydrate all week long. That doesn’t mean you have to load up on sugar on Gatorade. It means getting the salts and water you need. Most days at work I’ll have one big glass of water with a Nuun tab. On the brutal run on Saturday all three of these came in very handy. I couldn’t have survived without all the termolyte pills, half way into the run I could feel salt caking on my face and knew I was loosing more salt than I usually do so decided to make use of my extra 2 thermolyte pills on the run. When we finished I was completely wiped out and didn’t think I could have made it 10 more minutes without falling asleep. Luckily my recovery drink (Cranberry Blend Juice with Whey Protien) was on hand and once I had that in my system was able to relax and finish out with a long stretching routine. After the 14 mile run today Ruth and company arranged a nutrition seminar for Team Rogue that is one of the better ones I’ve been to in the past few years. It went over an hour and Amy was very accommodating to all the questions people had. Amy covered details about daily workouts, differences in requirements depending on your intensity and amount of workouts per week. She went over daily needs, pre-workout, during workout and post-workout. One of the things we do generally hear is the recovery drink and importance of getting it in the 30 minutes right after finishing. A general guideline from Amy was 50 g of carbs and 15 g of protein so I thought I’d compare that to the recovery drinks I tend to have. So the silk soy mil was the best and closest so I may need to stick to that. The other thing would be to reduce the serving size of the mix and work in some carbs through a banana. Or try the whey protein with some juice. It’ll be fun to experiment with what works and … of course what tastes good. Amy Culp, RD, LD is a skilled nutrition expert with a passion for promoting nutrition and wellness. She is a Registered and Licensed Dietitian specializing in eating disorders, sports nutrition, weight management, and “family” nutrition (working with parents to raise healthy and happy eaters). Amy also works as a sports dietitian for the University of Texas athletes, and as a nutrition consultant and speaker for large and small companies nationwide. Given the heat and just not so great running weather I thought I better start hydrating again. When I first started running I would drink Gatorade like it was going out of fashion (I hope that’s the right phrase … remember “I’m not from this country”). After a while I realized there’s so much sugar in energy drinks if what I’m trying to do is just hydrate then I need to try something else. Steve Sission (Team Rogue coach) recommended Electormix. Since them I’ve used that Emergen-C and recently NUUN. So Electromix, no sugar but you have to make a liter and doesn’t taste like much. Emergen-C is good for a glass so easier to use, more vitamins and minerals in addition to the electrolytes. NUUN, drop the tablet and you’re good to go. Now each of them have different amounts of things in them, NUUN seems to have the most sodium. So too many choices, I think I’m going to leave it to taste. Emergen-C I can only handle with really cold water, the other two with cool water. So that’s my decision. I’m sure there are lots of other options too but just these three are a few too many for me. What is the difference anyway?